Several months ago, I traveled to Dennard, Arkansas, to take portraits of Lalla Lee Ostergren for Arkansas Food and Farm. 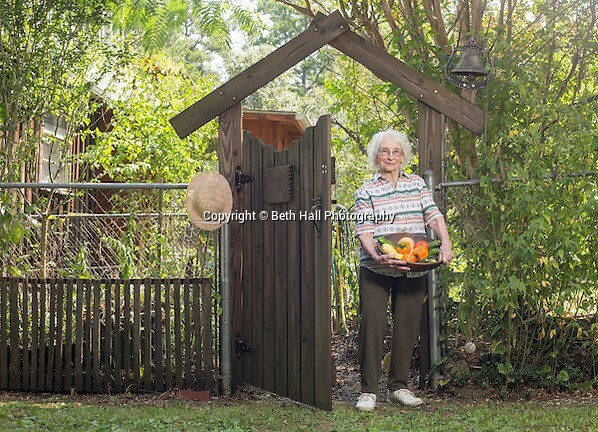 The magazine wanted to feature her holistic lifestyle and years spent as an organic gardener. It was supposed to be just a quick portrait along with some photos of her garden, but I ended up staying almost 4 hours and it became so much more. You see, Lalla is 91 years old and has such an amazing story. She was living in Phoenix, Arizona, and was diagnosed with systemic lupus as a result of exposure to pesticides and other pollutants, she said. She was in her 50’s at the time and decided to move home to Arkansas to die. While living here, she started paying attention to the food she put in her body. She gave up eating meat and took on growing organic vegetables and herbs, and soon she started feeling better. She attributes her healing to her lifestyle change. Lalla’s organic gardening provided for her family and friends for many years. This year, however, her garden was not the bountiful beauty that it had been in the past. She said that she had not kept up with it since her husband’s passing a couple of years ago, but she was working on a redesign that would make it more manageable. She expressed her concern for how it would look in the photos and I assured her that everything would look beautiful. Selective focus can be such an amazing tool… that and a 1.4 lens helped me to showcase the vegetables and herbs and minimize any weeds or disrepair. I spent quite a bit of time photographing the garden, and then stepped inside and sat with Lalla for a couple of hours and talked. She served me a glass of Kombucha Tea in a “long stem” while she drank hers out of a coffee cup. She showed me the original papers that came with the first “pancake” that she started in 1994. It was at this point that I was thinking about the 3 hour drive and hoping I would make it home ok. The tea had an interesting flavor of apple cider with a kick of vinegar at the end. It wasn’t good, but it wasn’t bad either and I found myself sipping on it during our entire talk. As we sat in her living room, she told me her life’s story: her work life in Arizona, how she got a degree in holistic medicine in her 70’s, that she’d written 2 books, has a son and a late husband. She also talked about her grandmother, Sophia, who lived on a route through Arkansas to St. Louis. In the late 1800’s, families would travel the route to take sick loved ones to STL for medical treatment. A stream ran through her grandparent’s property and people would stop and sit on the bank to rest. As people traveled back home, often times their loved ones were still sick. Her grandmother would ask the families to leave the sick person with her and she would nurse them back to health by using herbs that grew on the creek bank. During the Civil War, she even aided wounded soldiers from both sides despite any repercussions if she had been caught. Lalla talked about the rocks her grandmother used to grind the herbs for her treatments, and how she had special pockets in her skirt to hold them. She walked over to her kitchen window sill and reached for the two rocks. She held them together and talked about how they were one of her favorite things. It was so neat to hold the rocks and look at how they perfectly fit together. It was even better to see the rocks in Lalla’s hands. Our visit finished with a portrait at her front gate. She stood near a sign made by her son, and held a bowl of vegetables that were given to her by friends and neighbors. She said she spent so many years feeding others from her garden, she was grateful to those who had reciprocated on a down year. Sometimes the photojournalist in me gets sucked in, and all I want to do is listen. I love editorial photography because I get to learn about other people and their lives. Over the last 15 years, I have met so many people and heard so many stories, and all it takes is a glance at one photo and I remember all the details. Thank you to all of those who have filled my life with stories.